The Elo 2200L has been discontinued. No direct replacement is available. 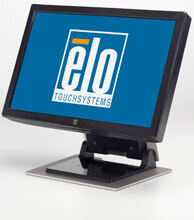 The ELO 2200L is one of the first wide-aspect ratio touch monitors with a virtually 100-percent useable surface area. The unique "zero-bezel" design removes the frame, or bezel, of standard monitors to create a seamless glass surface that showcases the wide-screen, high-definition experience today's consumers have come to expect. This smooth, seamless touchmonitor surface is possible with state-of-the-art Elo TouchSystems Acoustic Pulse Recognition (APR (Acoustic Pulse Recognition) touch technology) touch technology. The 2200L is intended for use in high-traffic retail, hospitality and other public environments, and offers both aesthetic elegance and world-class durability. ELO touchscreens are some of the most implemented and can be found in a variety of applications. With its rugged design and superior optics, the 2200L is ideal for public applications like a kiosks or information portal. The wide-screen format provides more room to work with allowing even easier interaction for the end user. The 2200L is made to be used daily so for a simple desktop application the ELO 2201L would be a cost effective replacement. The 2200L is the best match for any high traffic application that needs a wider touchscreen without any sacrifice in performance.